Welcome back to the TJGT Alumni Spotlight! 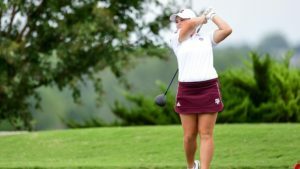 In this week’s spotlight was coaches favorite on the TJGT, collegiate golfer at Texas A&M University, Courtney Dow! As a junior golfer, Courtney was ranked a No.9 recruit nationally in the 2016 recruiting class and the No.2 recruit in the state of Texas. She was named a Rolex Junior All-American with 3 AJGA victories under her belt. She competed in 22 tournaments with us on the Texas Junior Golf Tour. Out of those events, she carded 8 championship trophies, 5 runner-up finishes, and 5 Top-5 finishes, most of which events were majors. 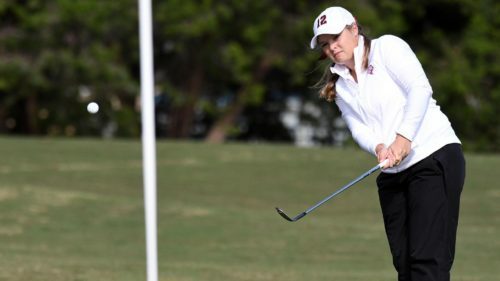 As she enters the spring season of her junior career at Texas A&M, she has already accomplished much as an Aggie. Just as a freshman she was named to the SEC All-Freshman team and averaged 73.60 strokes that year. She also shot an impressive 7-under, yes you read that right. 7-under at the Maryb S. Kauth Invitational hosted by UTSA. As a sophomore she broke into the Nationally Ranked Top-100, ranked 84th with an outstanding stat beating 62.5% of her opponents that year. We wish her and the Aggies best of luck in the 2019 Spring Season on their way to conquer a National Championship! Here’s a little more about Courtney!